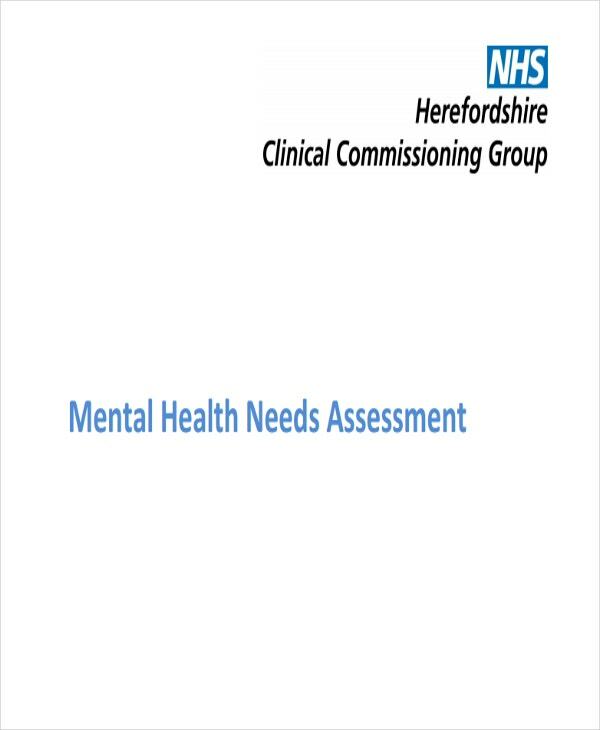 What is a needs assessment? Why is it important? 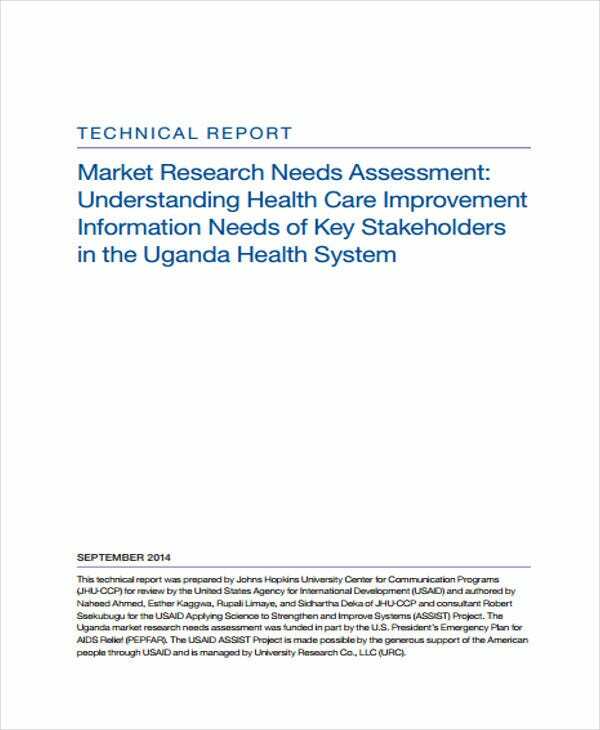 Do needs assessment forms contribute to the success and accomplishment of needs assessment objectives? The key ideas emphasized on this post will answer the mentioned questions. 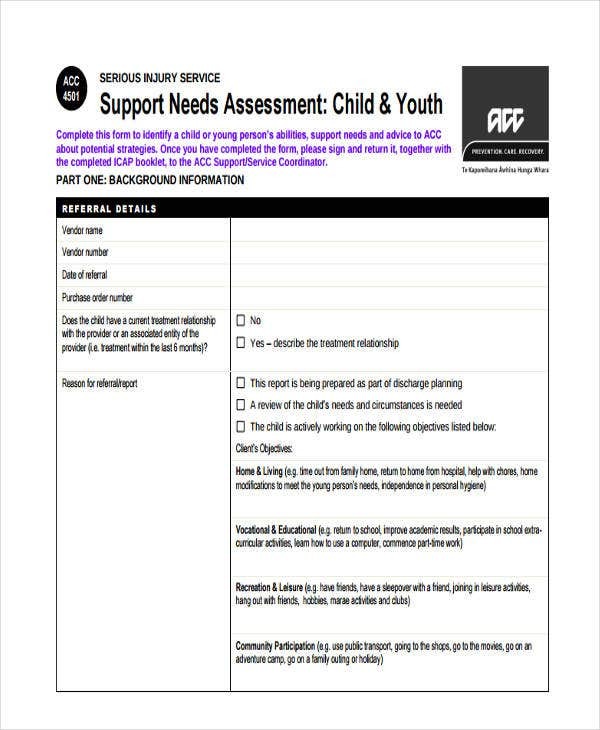 Nowadays, needs assessment forms are highly-needed in most institutions. Because of the success of most need assessment endeavors both manifested in the domestic and international arena, the stakeholders that make use of such processes are increasing. 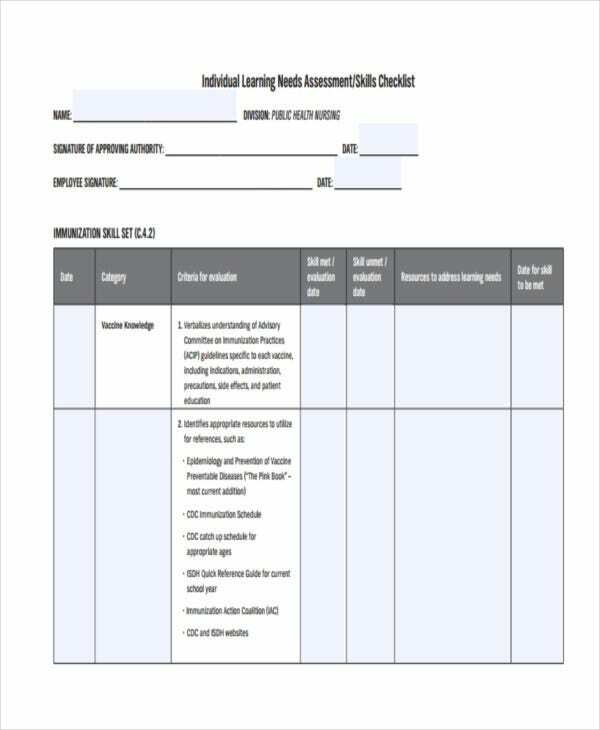 There are different types of assessment templates for different types of assessments, including summative assessment and formative assessment. 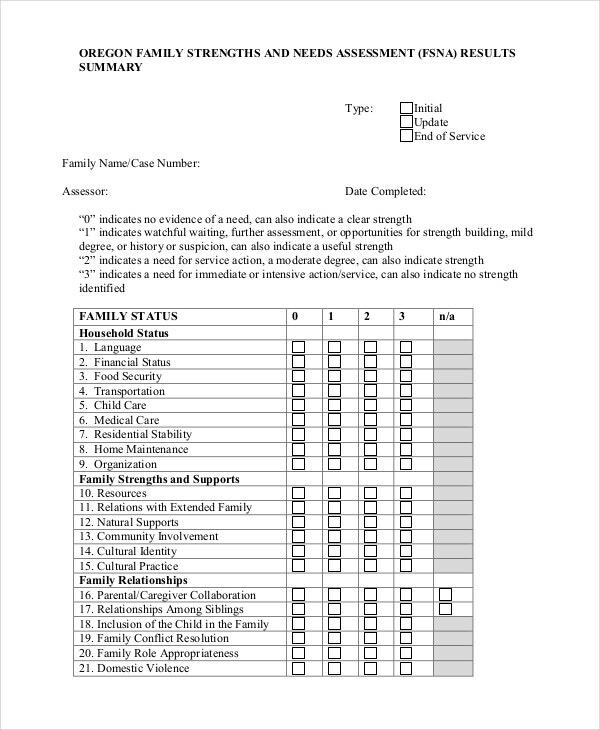 To ensure that your processes come up with reliable results, the selection of a needs assessment form is very critical. 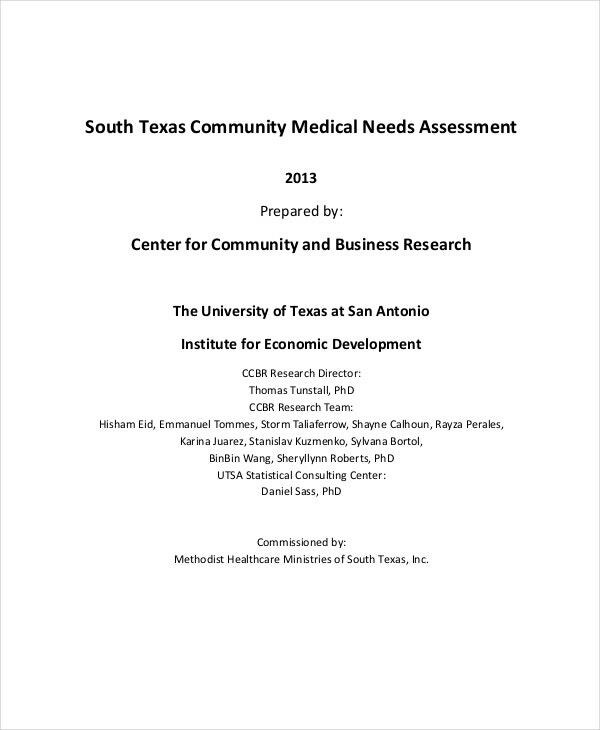 To fully comprehend and appreciate the importance of needs assessment forms specifically the sample needs assessment templates provided, one must understand important terminologies and concepts that relate to needs assessment processes. Firstly, needs assessment is defined as a systematic process that is divided into different stages and phases. 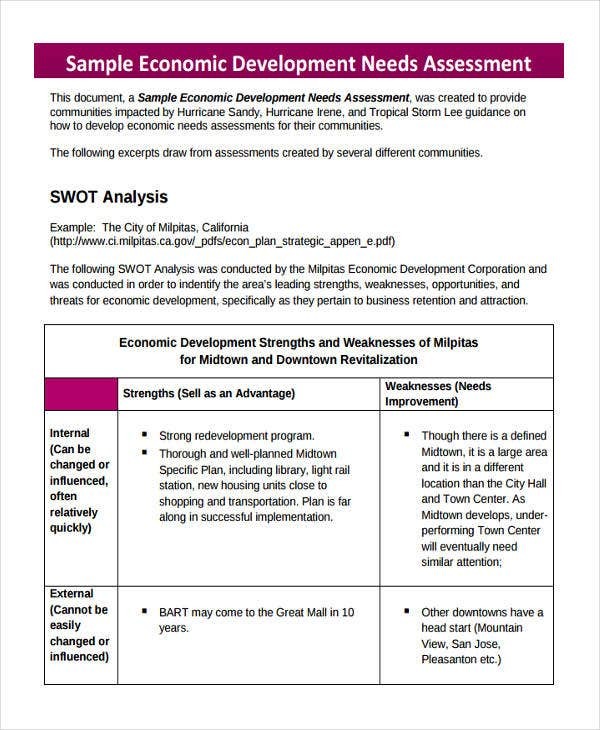 In line with this, all the components of a needs assessment template are interdependent with each other and affects the conduct of one another. Secondly, there are different types of needs assessment depending on the nature of the institution involve, the purpose of the needs assessment, and the stakeholders and beneficiaries involved. 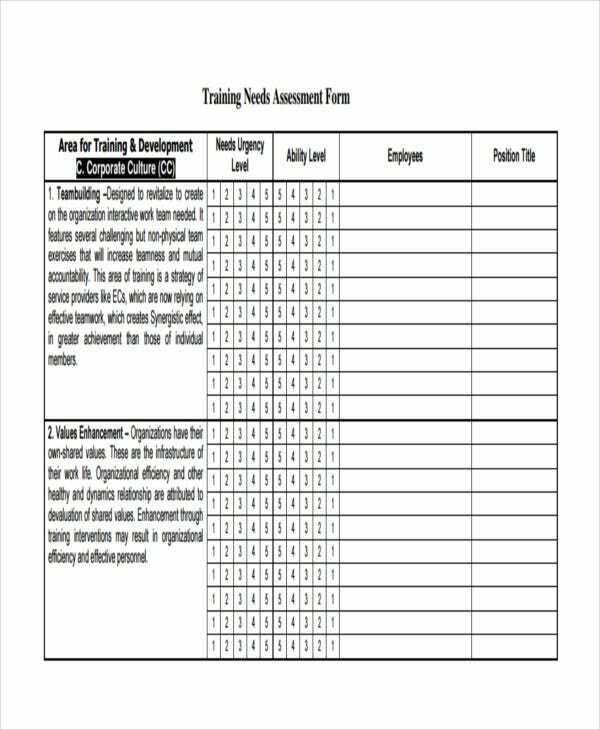 For example, in the field of information technology, there are technology assessment templates while on the field of employment and training, there are skills assessment templates. 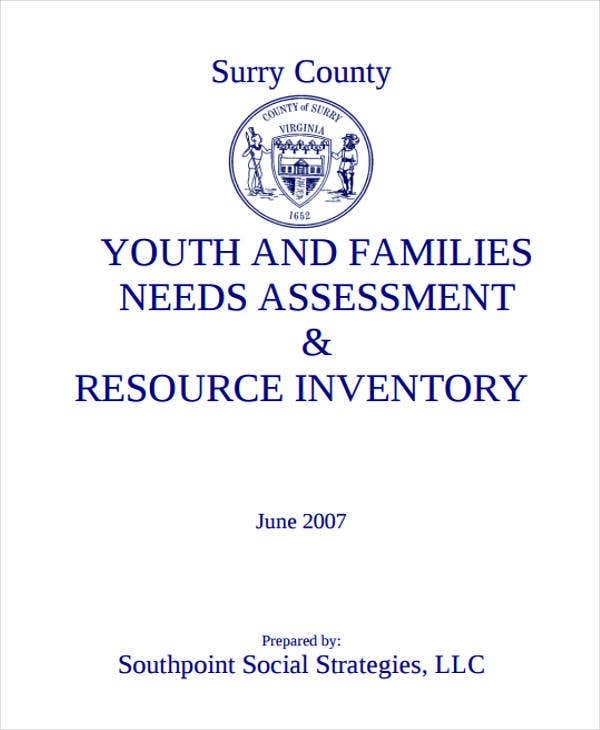 Thirdly, the results and findings of a needs assessment form are used as basis in coming up with a comprehensive needs assessment plan. 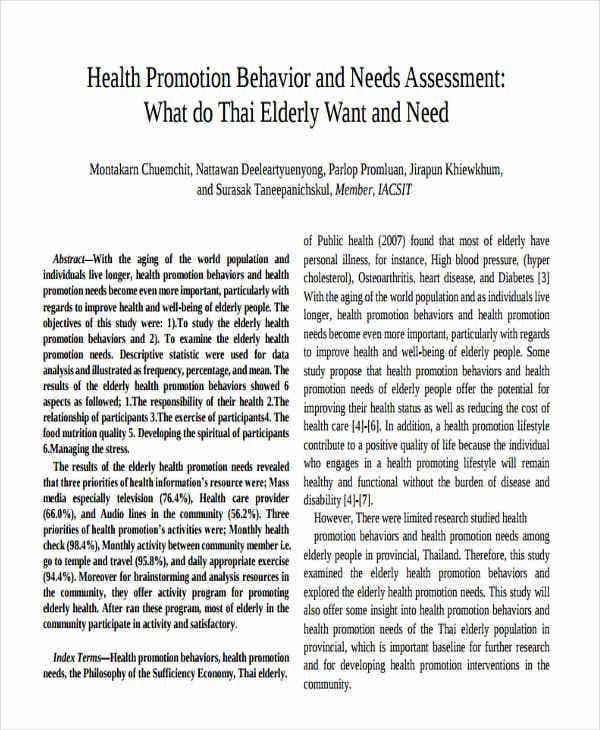 And lastly, there are methodologies and approaches adopted by the proponents of the needs assessment depending on what particular approach suits them. 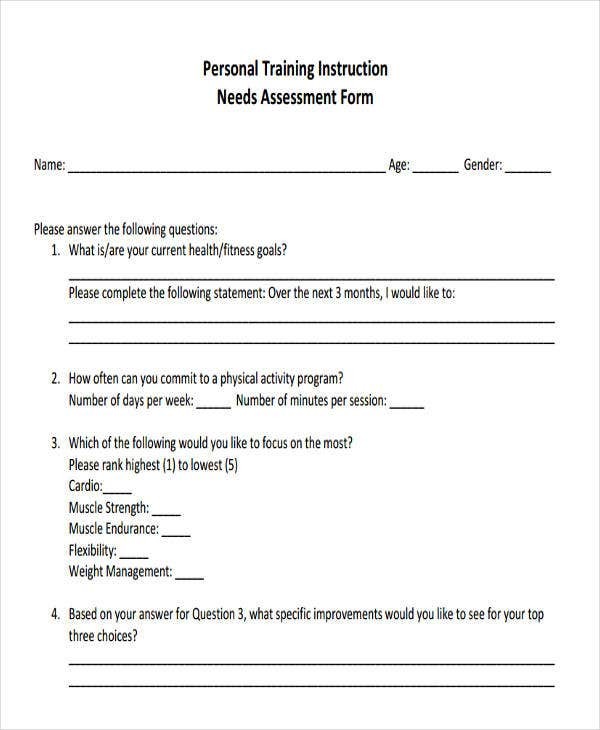 Furthermore, needs assessment forms are used in conducting surveys, focused group discussions, personal interviews, and many more. 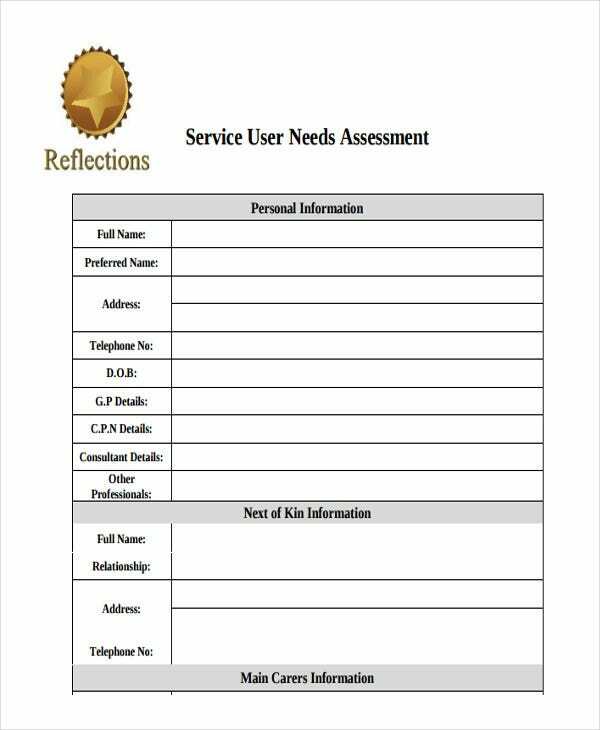 Business Needs Assessment Form Templates – It is a common knowledge that businesses has its own strengths and weaknesses. 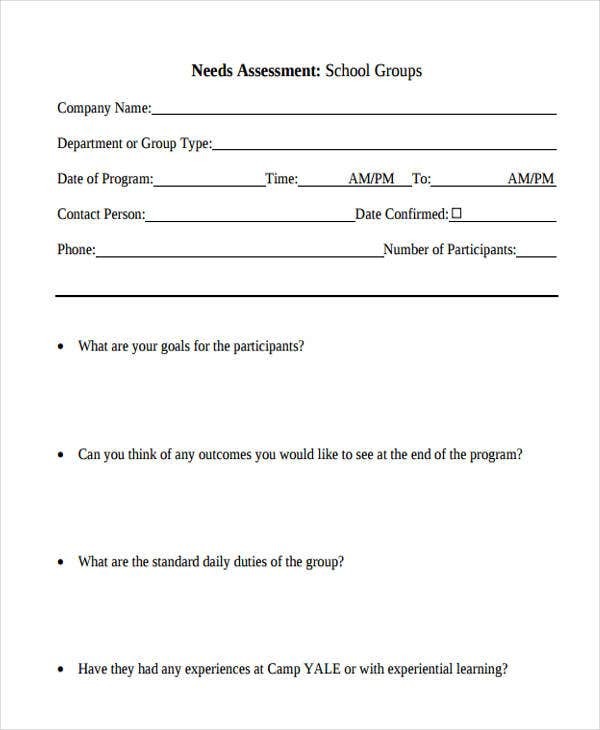 Business needs assessment forms are used to foreground these kind of information. 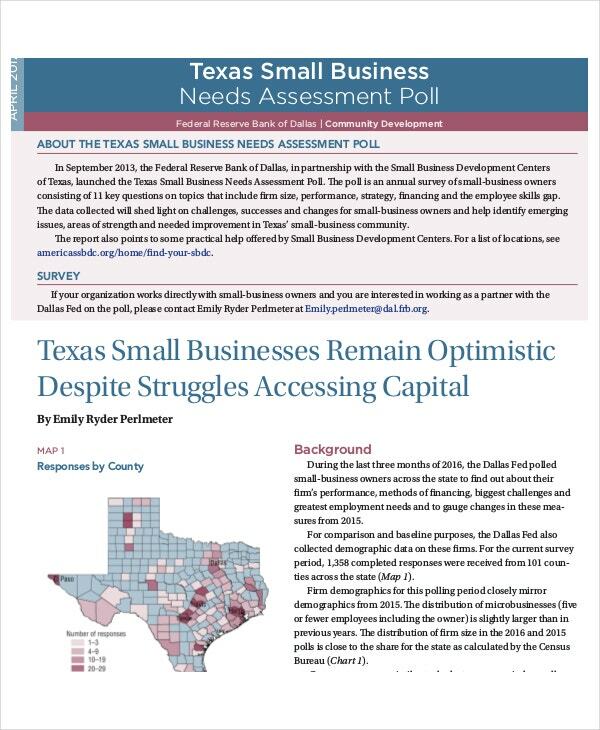 The free needs assessment templates provided cater to the context of small and large scale businesses, business analyst-related functions and programs, business development, and many more. 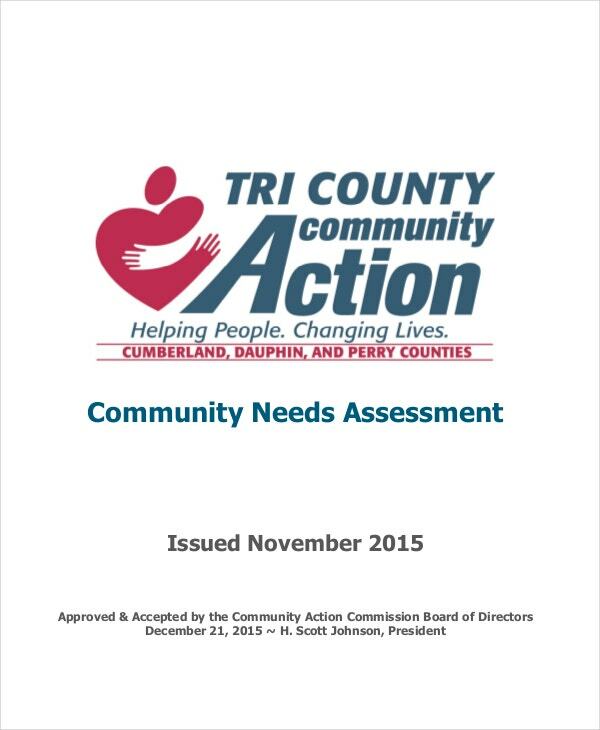 Community Needs Assessment Form Templates – Generally, needs assessment forms are used by not for profit organizations and other non-governmental organizations to assess and analyze the needs and issues a certain community is facing. 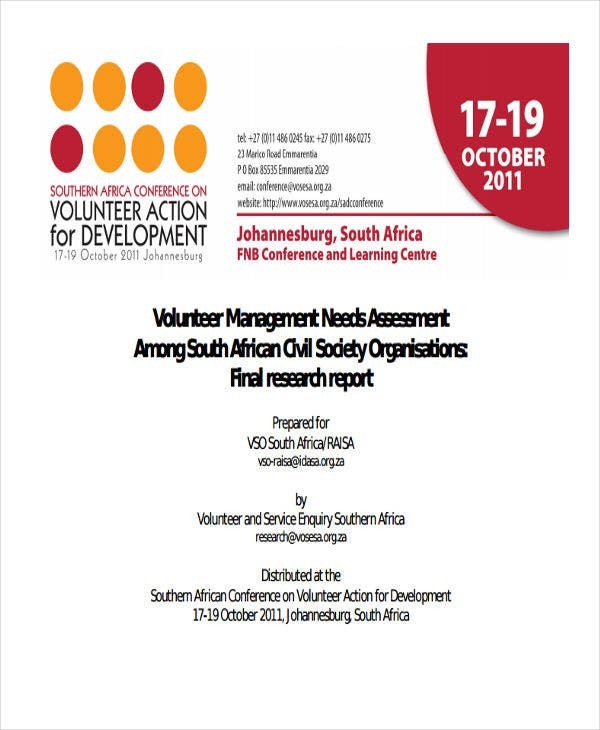 Need assessment processes are considered as great tools in building community resilience and development. It caters to the health, social, educational, and security needs of the community. 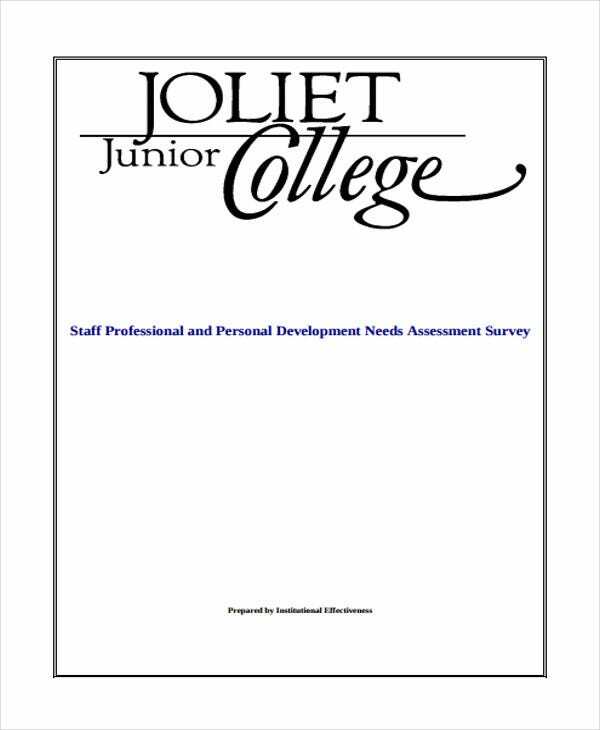 Educational Needs Assessment Samples – In the realm of academics, needs assessment forms are used by school administrators and educators in foregrounding the concerns and issues experienced by the stakeholders involved in an educational institution. These type of assessment are conducted for the continuous growth and development of students Similar to competency assessment templates, educational needs assessment aim to provide solutions and make students more academically competent and competitive. 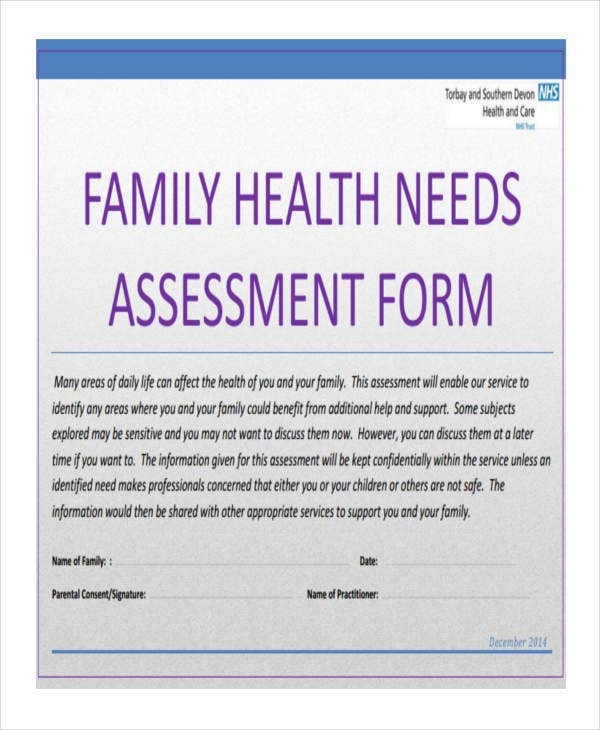 Family Needs Assessment Templates – There are also governmental and non-governmental agencies that look into the needs of specific families or a particular household. 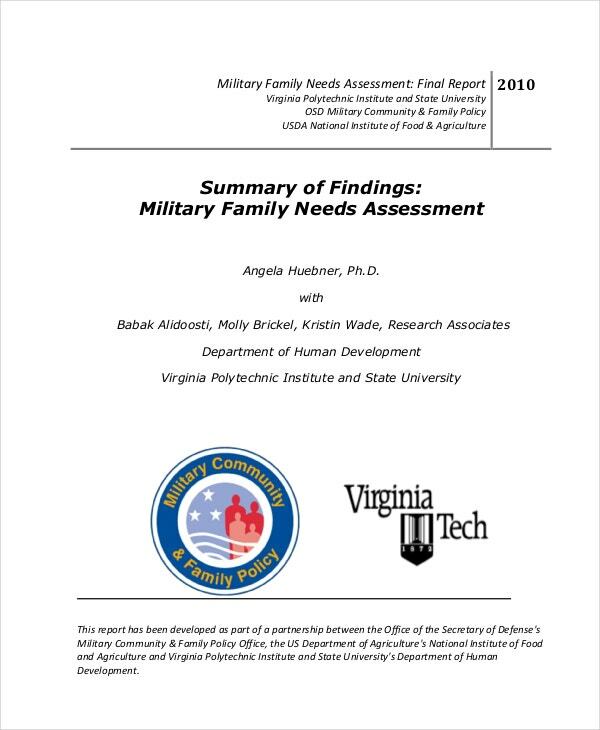 These are used to assess and examine the subjective needs of a certain family, the reasons for their struggles, and what factors were considered as hindrances to their development. 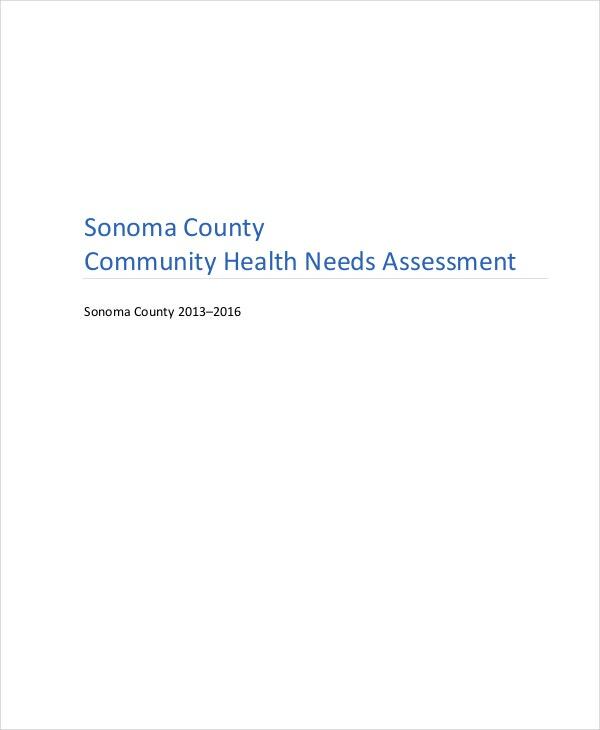 Health Needs Assessment Templates – In terms of physical, mental, and psychological well-being of a certain individual, health needs assessment are used by medical institutions and organizations to determine the health condition of particular individuals in order to know their subjective health needs. Performance analysis – This type of approach examines and analyze the skill-related deficiency of a certain individual. As shown in self assessment templates the holistic context of the individual must be considered. The results of the analysis will try to answer and resolve skill-related deficiencies such as in the case of a training assessment. Contextual analysis – This type of approach aims to analyze the environment that the individual or business functions. In contrast to performance analysis that is focused on the skillset of the target population, this type of analysis concentrates on the macro aspect of the community, business or organization. Feasibility analysis – This type of analyze aims to examine and analyze whether or not a planned project is feasible. 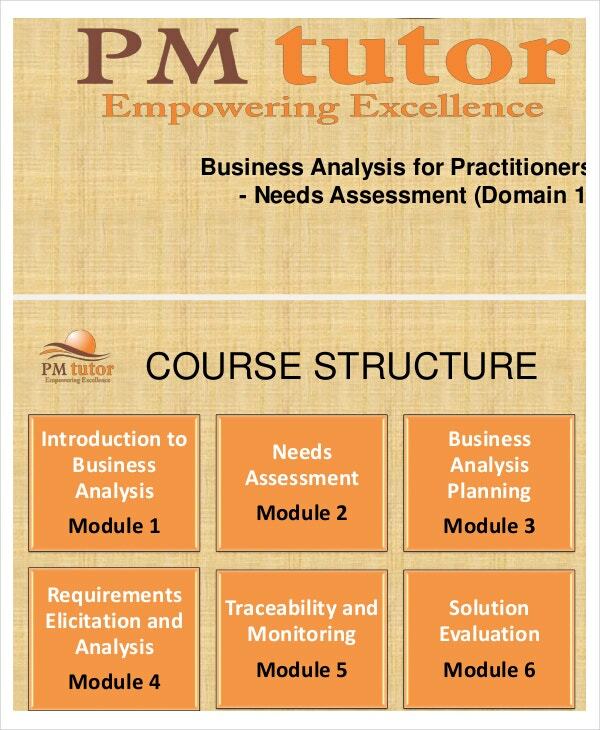 These are usually used in project assessment and development undertakings. 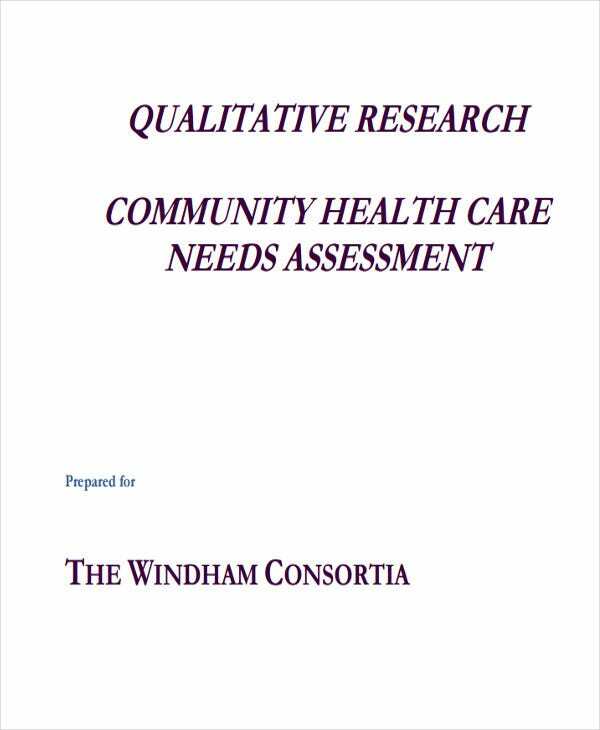 In terms of security assessment templates, this type of analysis will focus on the issue whether the planned security approach is feasible taking into account the resources and the communities involved. Helps build employee or member confidence. 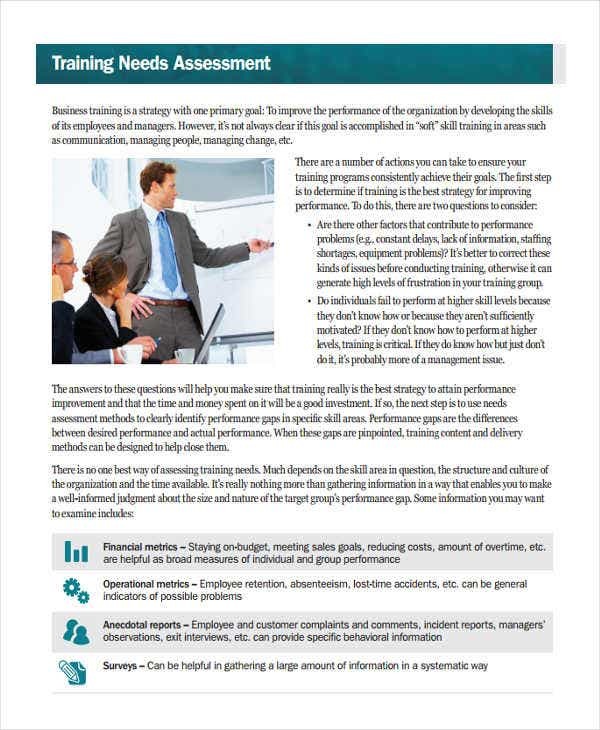 Training needs assessment gives employees in a business setting an impression that their professional growth and condition is valued and considered as a priority by their employers. 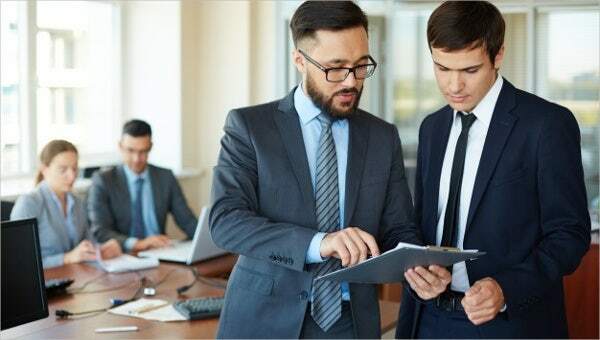 Knowing their level of expertise and at the same time their respective training deficiencies can help boost their self-confidence and eagerness to grow and excel in their works. 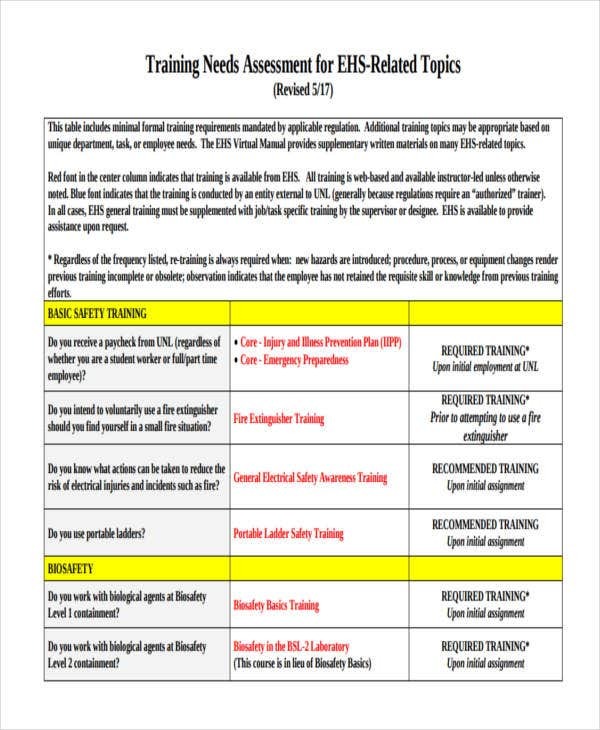 Allows employers to know what training needs must be prioritized. 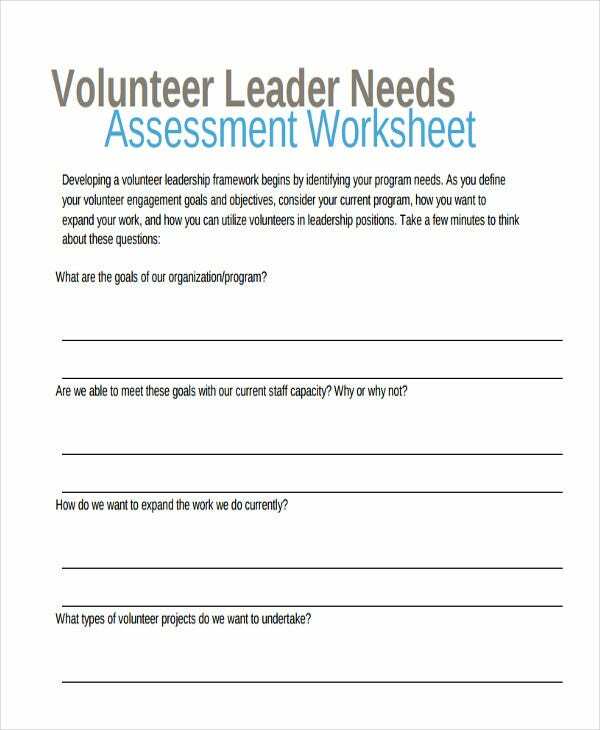 By using a needs assessment template, it will be easy for employers to know high-priority training areas and needs. 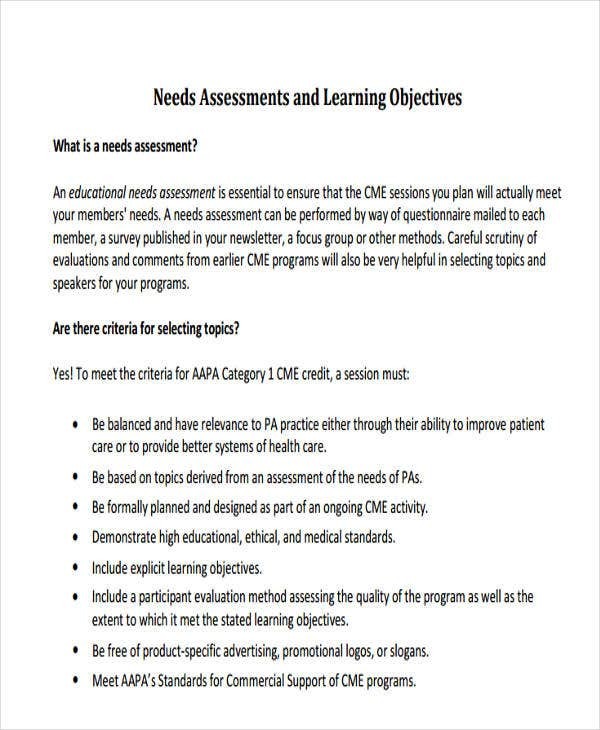 Like nursing assessment templates, nurses are subject to mental and skill-based examinations to know their level of competence and avenues for growth and improvement. And lastly, it can help you gain more profits. As they say, happy and satisfied employees can help stir your wheels of success and will serve your clients in a better and improved manner.